UC Connect is a collaboration platform designed for both large and small enterprises and government customers. The cloud application provides greater mobility, bringing together HD voice and video, messaging and meeting into a single platform, accessible from anywhere, anytime, using any device. UC Connect seamlessly aligns your communication channels to create streamlined, user-friendly experiences while delivering advanced PBX features and software integrations. Are your staff tied to their desks? Free your workforce with UC Connect. Cloud technology enables staff to use their office number anywhere, and easily move calls between their desk phone, computer and mobile devices. UC Connect keeps your organisation connected like never before. User-friendly apps enable staff to call, conference and chat without having to change devices and without losing the advanced business calling features and capabilities of your enterprise PBX. 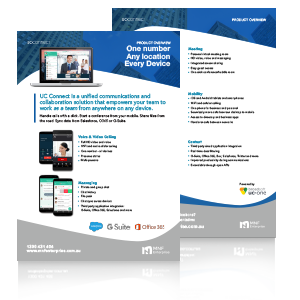 With UC Connect, you can communicate and collaborate from the cloud apps and software you already use. Powerful feature integrations and two-way data syncing enable you to put UC Connect at the heart of your enterprise workflow. Enable click-to-call and call logging within Salesforce and other CRMs. Plus, pull in contextual intelligence from O365, G Suite, Box, Twitter and more. Optimise your enterprise communications with real time data. UC Connect empowers you by allowing you to record and review calls, to optimise the communication performance of your organisation. 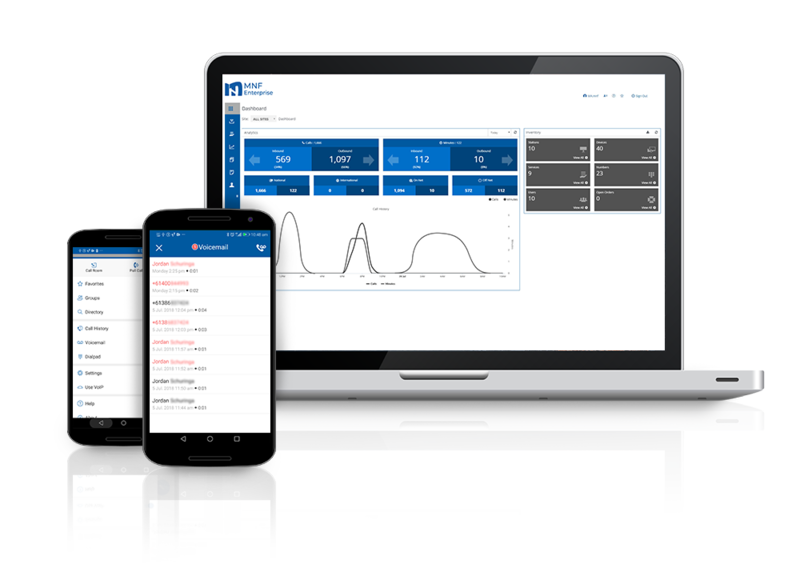 Monitor key performance indicators, interrograte call statistics and report on usage trends, manage, control and report inventory costs.